New skates come out all the time, but most of the time they’re just updates to existing skates : New colors, new bits and pieces, minor tweaks here and there… It’s not necessarily a bad thing, on the contrary, but it’s not everyday that truly new skates comes out. So when that happens, I’m always very eager to try them on, even if I don’t plan on getting a pair for myself. 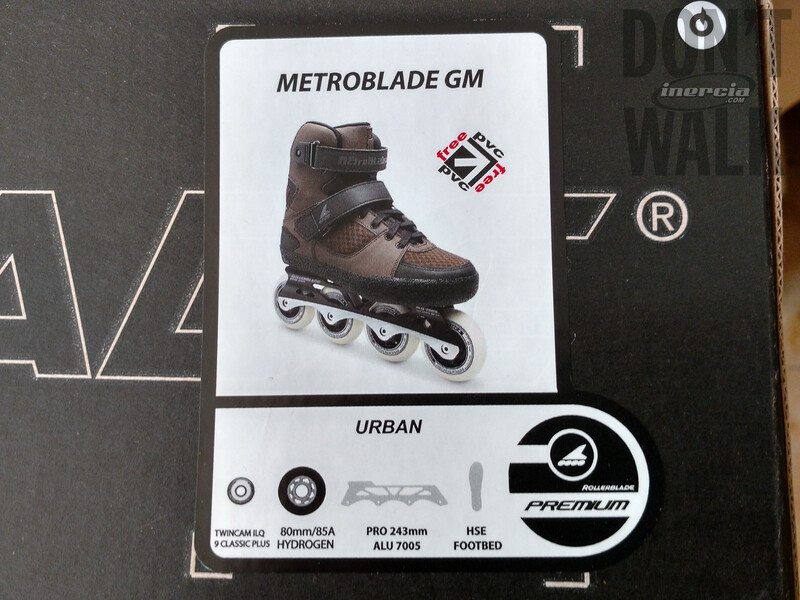 Enter the 2016 Rollerblade Metroblade GM: I didn’t have high expectations for them, though the official teaser had piqued my interest. Was it pure marketing, or was there really something special to expect? 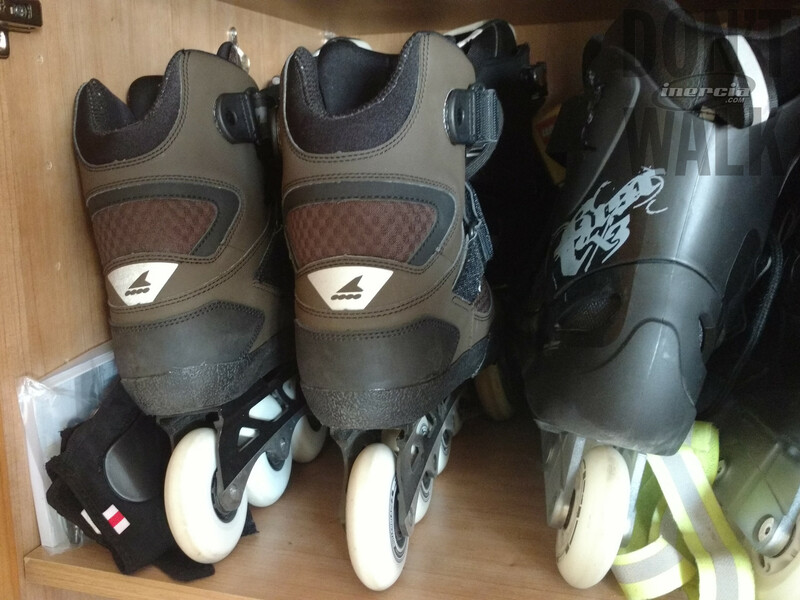 Well, it wasn’t marketing, it was just a matter of fitting them on and… these skates blew me away! Before trying them on, I really didn’t expect to like them : No separate cuff? Weird oversized V-cut? Non-replaceable liner? Useless “good looks” that will only add weight for nothing? Those were my first thoughts, not exactly positive. Luckily, I always abstract them away when trying the skates on. The brand, the color… I try to have an open mind and really only base my opinion on the actual feel of the skates and the skating experience they provide. Still, I was expecting my own verdict to be at best a “meh…” and at worst a “not for me!”. When I put the Metroblades on for the first time, it was easier than I thought. You only need to loosen both straps and the 2 first levels of laces to effortlessly put your feet in. Nice! So then I thought tightening would be complicated to get right with those velcro straps… Wrong! The lacing and straps are absolutely perfect, more on that later. Usually at this point, I fear my reaction to the first “flex” forward, back and sideways, where top buckles can get in the way, cuff sides can press too hard on the leg, both indicating potential annoyances to come. 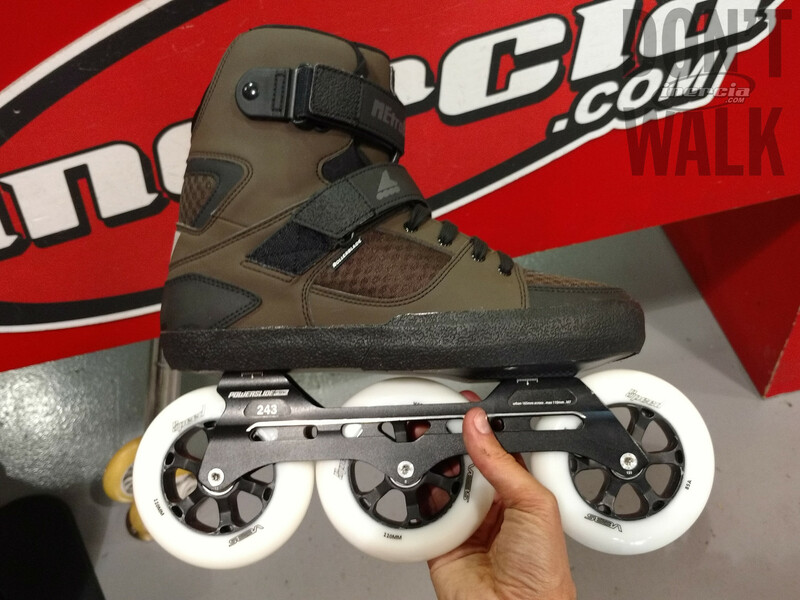 But none of that with these skates: No separate cuff, yet the flex is great and comfortable. I honestly didn’t think it was possible. I’m writing all this after having owned the skates for over a month, and having skated nearly every day with them. Nothing hurts, nothing gets in the way. They’re light, they’re a pleasure to skate with, and although they look a bit dull for my taste, they “just work” at being awesome skates. The frames are great, and the bearings and wheels too. 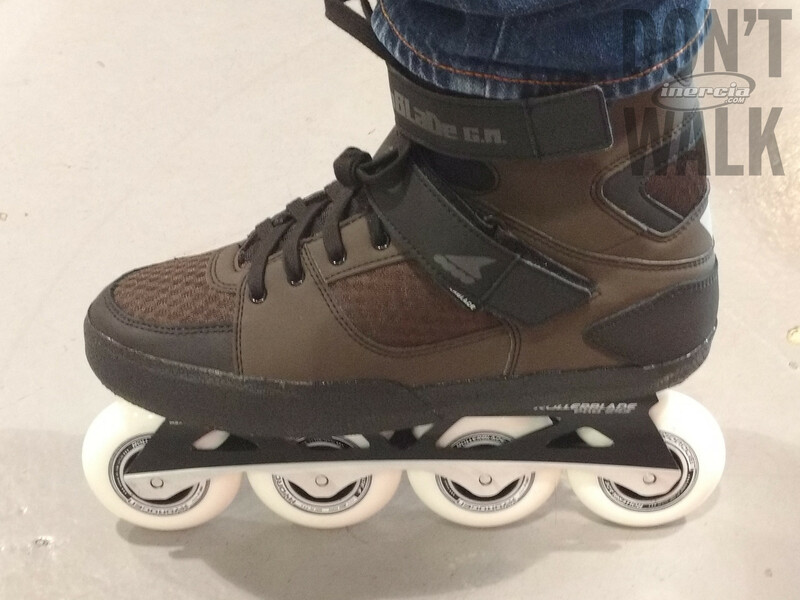 These are actually the first Rollerblade Hydrogen wheels I skate with, and I’m very pleasantly surprised, as their grip is great and they were extremely quick to start sliding properly. I can’t personally say anything about their durability just yet, but having performed quite a few slides, it should be fine. Now, to anyone still thinking that speed buckles are always better than velcro straps : Please keep an open mind and… think again! I agree 100% with Greg’s choice, as these straps get less in the way and can be closed extremely tight. Not only that, but they have velcro on both ends, meaning that they can be initially centered to your taste in order to not stick out, then be tightened identically each time. Low tech done right, without marketing in the way, it’s refreshing! I hadn’t been so excited by a new pair of skates in a long time. Being so easy to put on and take off, as well as light to carry, they have become my current “daily” skates. Thanks Rollerblade & Greg for making these! GREAT JOB, and I mean it! For starters, I would like to thank you for this review. It is the first test of Metroblade I’ve read that focuses on skating experience instead of “technical aspects” so obvious I could just go to the shop, examine skates in my hands and learn the same things. I must admit, I had lukewarm feelings about this skate (at best) but your review has changed my perspective a bit. I’m actually following your blog for quite some time and it helped me to get in to modding skates myself. A lot of useful infos and ideas you’ve gathered here. As nowadays I’m running a website about skating in Polish (in-line.pl) I would like to ask you – would you ba so kind to allow me doing a translation of this review to Polish and publish it on my website? I would really like to share your insight with Polish community in our language, as knowledge of English beyond level A2 still isn’t that widespread in our country and people often have problems reading articles. You have my e-mail, please contact me if you are positive about the idea! If my actual size 27.5cm and feet is wide shape, what size I need? 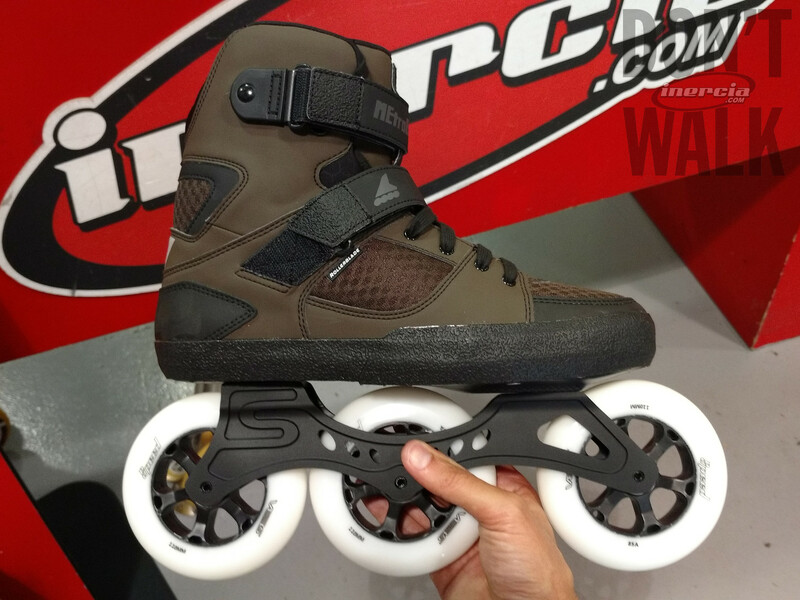 Is this skates compatible with wide feets? If your usual size is 27.5, you should definitely consider trying both 27.0 and 27.5 if you can. Thias, thanks for reply and have a nice day! Hello, thanks for the nice review that is describing more than just specifications! Which part of the boot provides the most support for the foot? 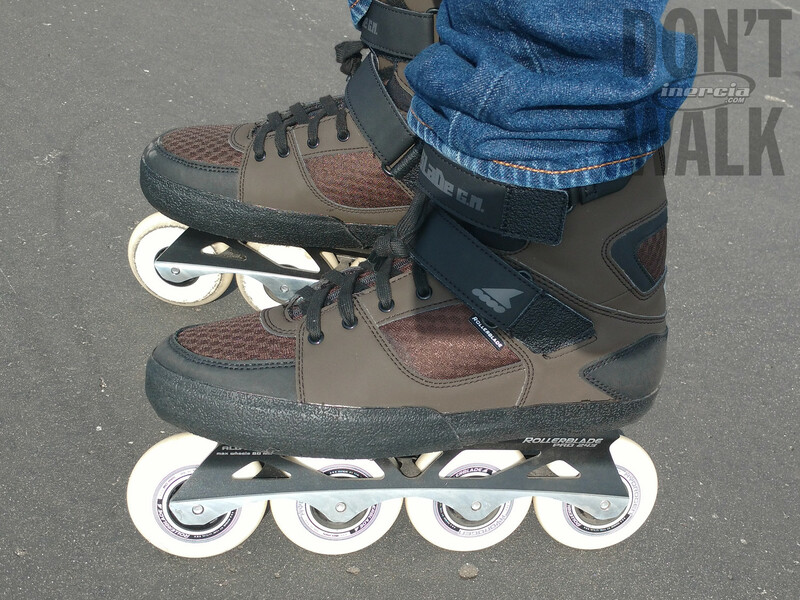 I have tried these skates and it grips my foot well at the front but my heel can move up and down slightly if I am not standing in a low skating pose. I am guessing that is due to the boot design which has less support above ankles. My foot is 273mm and I was trying the 275mm (US 9.5). Have your boots broken in with use? I have a feeling that they don’t really loosen much because the foam is thin while some parts don’t have any foam (the back of the heel for example). Most of the online review discussed the internal size which for the 9US should cover for 270÷275mm.